It can be so frustrating going through your daily life worrying about what the scales have to say today and how you look in what type of clothes. Constantly wanting to cover up and hide your “fat bits”! We've all heard about models wasting away to size zero on a diet of espressos and cigarettes, but now it seems there is a far healthier and more natural way to harness the slimming powers of coffee. 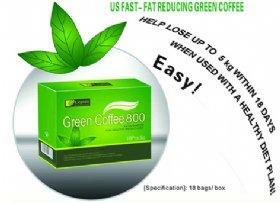 How does Green Slimming Coffee work? Ingredients in the green coffee beans inhibit the uptake of glucose in the intestines, regulating metabolic rate and resulting in weight loss over a period of 60 days. Already recognised as an excellent anti-ageing food, green coffee is loaded with anti-oxidants which fight free radicals, the substances that cause cellular damage and diseases. The active ingredient in the green coffee bean is the chlorogenic acid (CGA), A dietary polyphenol which limits glucose intake in the small intestine and regulates metabolism. In addition, by inhibiting the activity of glucose-6-phosphotase, it limits the release of glucose into the general circulation. This encourages the release of triglyceride from adipose (fat) tissue. The herbal extracts and minerals used in this product have been gathered from all over the world to make this all natural diet supplement. Ginseng helps to maintain energy levels while dieting. Another ingredient, heartleaf starts the fat burning process while curbing the appetite. Green Tea Leaf extract - a major antioxidant! It increases mental awareness and reduces appetite. It can also lower cholesterol levels and reduce the amount of harmful cholesterol. EGCG - Epigallocatechin gallate. The most powerful natural antioxidant which is superior to Vitamin C and Vitamin E. It protects our cells from oxidative damage from free radicals. We, at Melbourne Slimming clinic can individually design a slimming package to fight cellulite and get you into shape. New emerging research has found cellulite products can actually help give real, visible results, just as long as they contain the magic ingredient: caffeine. After a month of applying caffeine creams, volunteers lost, on average, 2/3 inch off their thighs. They also had smoothing out of their lumps. Experts say caffeine helps cellulite by speeding up the rate at which the body gets rid of stored fat. Here is a Melbourne slimming clinic packages that will help perk up your thighs, slim down your stomach and smooth out your buttocks! MESOSLIM – A hands on treatment performed by a qualified experienced therapist. It uses a patented fat burning formula and Nobel Prize winning medical technology. It reduces fat, remodels tissue and detoxifies skin. With its specific fat melting and cellulite reduction actions, it improves circulation, breaks down fat cells (adipose tissue accumulation) and helps re contour your body. Fantastic for reshaping post-surgery (such as lypo-suction) as fat distribution after this type of surgery can be give a very inconsistent, lumpy, uneven look to the body. MESOFIRMNESS – Also a hands on treatment performed by a qualified experienced therapist. The main actions of this formulation is to firm, lift and smooth the skin. It also has a strong anti-stretch mark actions. This gentle treatment strengthens your skin’s elasticity and allows to target such delicate areas as breasts as well as arms, abdomen, thighs and buttocks. Formula acting on loss of firmness caused by weight fluctuations, chronological ageing, pregnancy. Great following large amounts of weight loss post surgery or post dieting. Lymphatic drainage massage and Presor Therapy – This highly effective and very underestimated therapy helps is fantastic for a lot of things. Water retention and strong detoxifying action are just some of the benefits. It works to improve the function of your lymphatic system, which helps to remove and filter waste materials and toxins as well as excess fluid from your body. Good lymphatic circulation in the body is the key element for prevention of lymph fluid from solidifying and binding with the collagen fibres that are in the fat cells. Detox Foot Spa – speeds up the natural detox process of the body and works on energetic level. Keep your body clean in order to prevent disease taking hold. Your Immune System needs to be protected from toxic overload.